Leader Spotlight is a monthly blog to showcase our incredible volunteer leadership at The Mountaineers. Meet this month's featured leader: Christine Grenier. She is a 12-year leader who always remembers to keep trips fun, and to enjoy the wild places she's exploring. 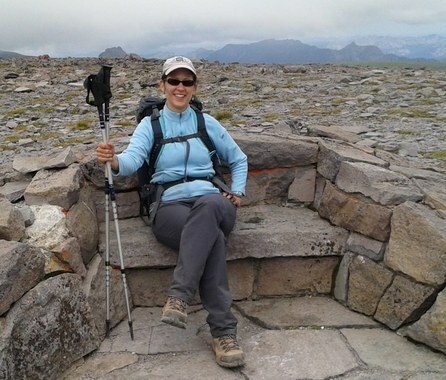 For our Leader Spotlight this month we talked to Christine Grenier, a hike leader with the Kitsap Branch who offers other Mountaineers the chance to slow down, look around, and enjoy the scenery. I had great mentors who motivated me to try it out and helped me build up my confidence. What is the favorite trip that you've led for The Mountaineers? Mt Townsend via the Little Quilcene route! How has your leadership style evolved as you've gained experience as a Leader? Early on, hiking was more exercise and less social. Following some injuries and having to slow down, I now offer others a chance to look around and really enjoy these wild places we are exploring. Are there any learning experiences you can share with us, such as take-aways from a close call or a near miss? In the Olympics, thunderstorms often roll in. Sometimes the storm will move on, but occasionally, they turn and conditions get scary. For folks who think they can make it, thunderstorms are no joke and the summit can wait for another day. Keep trips fun and remember that if someone isn't enjoying him/herself, it's nothing personal. Taking the time to find out why and encouraging that person to participate in the right kinds of trips goes a really long way. And sometimes that feedback can be shared to make programs better. There aren't enough weekends, but my favorite trips are car camps since the group can do 2-3 hikes and camp cooking is my thing. This year it was Mt. St Helens, next year, hmmmm. I look forward to hiking with you in the Olympics, Christine!